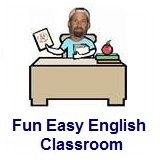 ﻿ Fun Easy English - new classroom free online classes english language lessons speaking listening writing reading november 17. Today in the Fun Easy English classroom you are going to learn "shoulda" an American English reduction. You really shoulda come with us. You really should have come with us. I shoulda bought everything on the shelf. She shoulda known there would not be enough food for the entire team. He shoulda thought before he spoke. I shoulda come over last night. Shoulda is used when talking about a past action which in retrospect was a good choice. Notice in the following video the American English reductions shoulda, woulda, and coulda are all used. 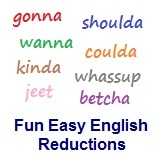 Reductions, such as shoulda are not real words in English. Hinder "Shoulda" - Hinder is an American rock band from Oklahoma that was formed in 2001. This is their song "Shoulda" with lyrics written in English. Use a dictionary to look up words you do not understand.